Mass shooting turns teen club party into "madhouse"
FORT MYERS, Fla. - At least two people were killed and nearly 20 total were injured in a mass shooting during a party for teenagers at a Florida nightclub early Monday morning. CBS Fort Myers affiliate WINK-TV reports the incident at Club Blu in Fort Myers happened around 12:30 a.m. in the parking lot during a "Swimsuit Glow Party" marketed at 12- to 17-year-olds. Police say three suspects have been detained so far, but that there's no known motive for the shooting. Club owners posted a statement on Facebook blaming adults picking up kids for the incident. Fort Myers police Capt. Jim Mulligan said the shooting was not an act of terror. WINK reports 16 people were treated at local hospitals, and two remain in intensive care. Officials say a total of three people remain hospitalized due to the incident. Victims in the shooting range in age from 12 to 27, officials said. The two teens killed were 14-year-old Sean Archilles and 18-year-old Ste'Fan Strawder, police said. Archilles lived about a mile from the nightclub, said his father, Jean Archilles. Archilles said his son loved to play football and basketball. Witnesses describe the moments outside the club as a "madhouse." People poured out of the nightclub, a witness said. One woman who lives two blocks from Club Blu said she heard about 30 gunshots from what she believes to have been multiple guns. Later, a nearby home and vehicles were shot at, resulting in a minor injury, police say. It was one of two crime scenes related to the incident, according to officials. Witnesses describe the scene at the club as a "madhouse." After the gunfire ended, the scene outside was overwhelming, a witness named Brian Martin told WINK. Martin said he rushed there because a friend of his was among the victims. "It was a madhouse people were running every where. All people were saying was their friends' names to see if they're okay -- a lot of phone calls to parents," Martin said. "But it was one of the scariest sights to just see people come pouring out like that." One woman who lives two blocks from Club Blu said she heard about 30 gunshots from what she believes to have been multiple guns. When she arrived, people were crying and screaming as others were being carried away in ambulances to Lee Memorial. "It was unbelievable," she wrote via Facebook. The club is in a strip mall that includes a daycare center and is across the street from a large apartment complex. Officers had the area taped off as crime scene technicians scoured the strip mall parking lot for clues. The shooting in Fort Myers comes a little over a month after the Orlando nightclub massacre, in which 49 people at a gay club were killed by a heavily-armed gunman in an hours-long standoff. 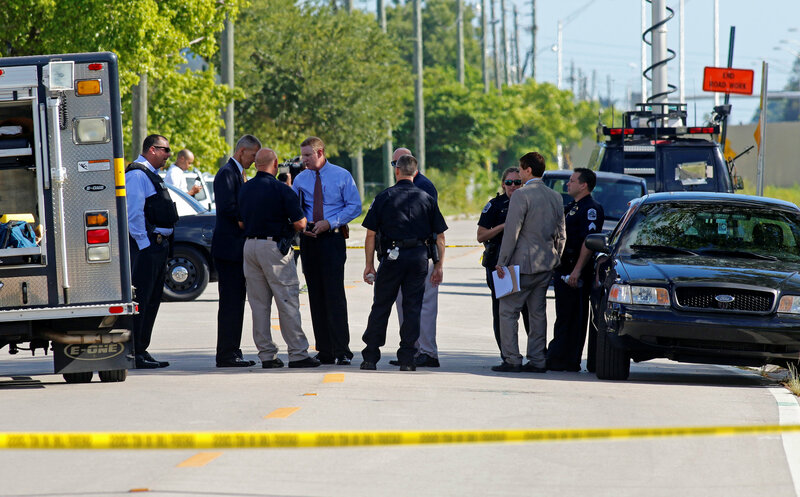 It is to date the deadliest mass shooting in U.S. history.